A lot of detail can be seen by zooming in. Center St. crosses the canal in the middle of the picture, and the First Baptist Church on Center Street can be seen in the upper right corner. The Philadelphia & Reading RR tracks can be seen on the left, in back of the houses facing Filbert Street. The man in the kayak is Benjamin Budd Cannon. The coal yard of William H. Barr is in the foreground. Six years after the Great Fire, the buildings are all new. The picture was taken from the top of the Rippel building at 80 Broadway, probably by photographer John Rippel. 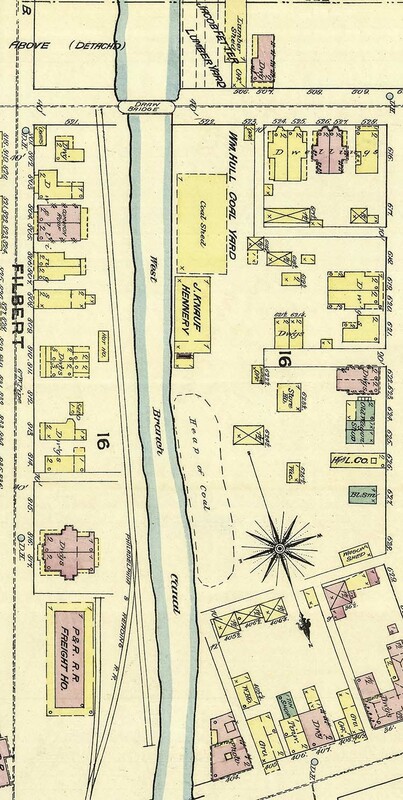 Below is a map of the area from 1890.